Homefacebook pageHow Can I See my Blocked List on Facebook? Are you looking for a way to find the list of your blocked friends on Facebook but don't how? If yes or something related to that, let's get started with how to see your blocked list on Facebook. In this post, you'll see how to locate your blocked or ban Facebook friends on your application. However, when you settled your differences, you can unblock them. The reason is that unblocking people on Facebook helps them regain access to your profile. That notwithstanding, before an unblock user can access your Facebook profile, you'll need to send them a brand-new friend request. Before you can unblock someone on Facebook you'll need to first, see your blocked users. Hence the question; how can I see my blocked list on Facebook? 2. Tap on "Privacy shortcuts"
3. Scroll down and tap on "How do I stop someone from bothering me?" 4. On the drop-down menu, tap on "Blocked users"
7. Click "How do I stop someone from bothering me?" 8. Click "View All Blocked Users". 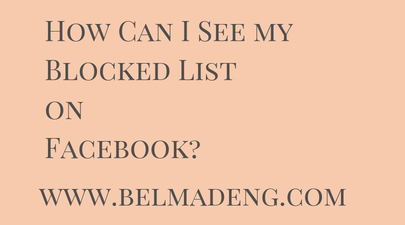 Please share "How Can I See my Blocked List on Facebook?" with your friends on facebook.